Complimentary upgrade from a One Bedroom Oceanview Suite to a One Bedroom Beachfront Suite (subject to availability at the time of booking). One complimentary dinner for four people (excluding alcohol). Valid for stays between 7 January – 22 April 2019. One complimentary candlelit dinner for two people (excluding alcohol). A sunset cocktail for two at the 13th hole. Complimentary activities each day including tennis, water sports, hiking and mountain biking. Valid for stays until 18 December 2018 and between 7 January – 22 April 2019. Not combinable with other offers. Receive a free upgrade from a One Bedroom Oceanview Suite to a One Bedroom Beachfront Suite for stays of at least 2 nights until 18 December 2018 and between 7 January – 22 April 2019. Stay at least 5 nights in a One Bedroom Oceanview Suite, One Bedroom Beachfront Suite or Two Bedroom Oceanview Suite between 7 January - 18 December 2019 and receive two complimentary seats on Grenadines Air Alliance flights from/to Barbados or St Lucia. 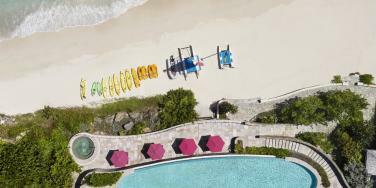 Stay at least 7 nights in a One Bedroom Oceanview Penthouse, a Two Bedroom Patio Villa or a Three Bedroom Patio Villa and receive two complimentary seats on the resort's private jet from/to Barbados.